Yachtzoo in Fort Lauderdale is offering the 40m Westport 130 motor yacht Mustang Sally for select charter in the Bahamas including Christmas and New Year. 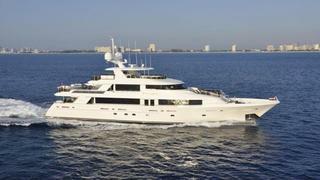 Built in 2009, she can accommodate 10 guests in five cabins, including a full beam on deck master suite. ABS-classed and MCA-compliant, she cruises at 12 knots, has a top speed of 24 knots and a range of 3,000nm at 10 knots. She also features zero speed stabilisers and a full range of water toys including a tender, two kayaks, two SeaDoo waverunners, water skis and snorkelling gear. Mustang Sally is available for charter at rates starting from $120,000 per week plus expenses.